When looking among 19th century women for those who might have been feminists, forged a path for women’s rights, or were simply independent-minded, the pickings are rather slim. Susan B. Anthony or Elizabeth Cady Stanton of the Seneca Falls Women’s Rights Movement spring to mind. There were likely untold women who chafed against the strict standards of Victorianism but very few who gained fame by flouting them. 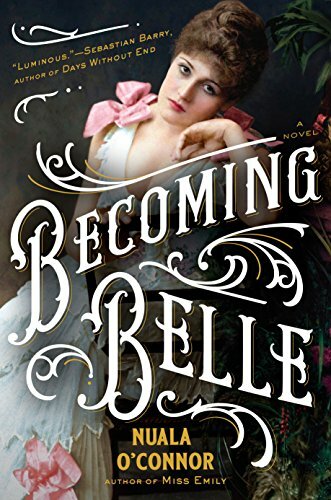 In that regard, the story of Isabel Bilton in Becoming Belle is the fictional portrait of a true story of a woman who certainly did not fit the mold of the late 1800s. This novel tells of Isabel’s transformation from life in a British military garrison town in 1887, to becoming a countess in Irish aristocracy a few years later, along the way singing and dancing on a London stage that sounds suspiciously like vaudeville. Isabel, who changes her name to Belle during this period in the theater, is depicted as a true-to-life Victorian feminist and prototype of a modern feminist era. While Belle’s bold and bohemian lifestyle was undoubtedly shocking for its time, a feminist she was not. Becoming Belle reads more like a supermarket tabloid, more a description of a spoiled, self-absorbed celebrity than a trailblazer for women’s rights. Reading Belle’s story is like following the foibles of a Hollywood starlet, only set in a society particularly unforgiving to women with children out of wedlock and who socialize with men. However, Belle shows remarkable pluck in setting out alone for London on the hope that she might land a spot in the theater. She does—one imagines her famed beauty had a lot to do with it. Belle quickly becomes the toast of London nightlife and attracts a bevy of suitors. She is drawn to an American, Alden Carter Weston, because of his claim he was a baron (overlooking the fact that Americans don’t have landed titles as well as Weston’s many faults). When Belle becomes pregnant, Weston leaves her in the lurch. After the birth of her baby, Belle continues to perform on stage, but she likely would not have endured her lot quite as well if not for the help of her sister Flo and her good friend Isidor Wertheimer. Isidor provides a home for Belle when she is about to give birth, and when Belle is unable to tolerate a crying infant, he arranges the baby, named Baby Isidor, to be shipped out to a wet nurse in the country. Following this scene, Belle is slightly down on the way home but can’t really put her finger on it. She is completely restored to good spirits when Wertheimer buys her a canary. Belle is still determined to marry up, preferably someone with a title. When she marries the fifth Earl of Clancarty, William LePoer Trench, it seems that she may have made it—but her new father-in-law tries to undo the marriage. While this series of calamities could be chalked up to Belle’s poor choices, that probably would be unfair. Many people make bad decisions but it’s how they deal with them that, of course, count. In Belle’s case, she seems to have an overriding sense of entitlement. It’s not that she takes advantage of others; she expects others to put her first above all. The end result is a “heroine” that is difficult to like.